Aromatherapy is the science of using the sense of pure, natural essential oils to produce effects that promote well being. 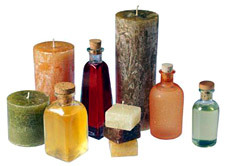 The basic elements of Aromatherapy are the essential oils. Essential oils are defined as the essence of a plant and are strong and volatile in nature. Different processes extract these essential oils. Research has shown, as Ayurveda has advocated for thousands of years, that synthetic compounds do not produce the desired effects, nor do those that contain alcohol. That is the reason, only pure plant oils can be used for Aromatherapy. Because essential oils are so strong, it is necessary to dilute them with the right percentage of carrier oil. A trained aromatherapist can help you find the right essential oils at the right concentrations for your particular needs. Some popular oils include lavender, clove, tea tree, sandalwood, eucalyptus, basil, bergamot, rose and citronella. Let us see some of the basic Aromatherapy facials that can be done at home, instead of going to the professional beauticians. These are very cost-effective methods and will definitely save you from having a big hole in your pockets! A basic facial must include the 3 elements of cleansing, toning and moisturizing. Additional steps can also include steaming, exfoliating and masking. Before cleansing your skin with a gentle cleanser, it is wise to give yourself a light steam treatment to open your pores and prepare your face for cleaning. And for that, simply soak a soft towel in a bowl of comfortably warm herbal tea. Wring out the towel and place it over your face and neck area and relax until it cools slightly. This opens the pores and brings blackheads to the surface. Remove blackheads with a blackhead remover. Be gentle and do not press too hard, since it will leave marks.. Then apply ice to close pores. This is very important to avoid blackheads from recurring. Steaming is also good for blood circulation. You may repeat this process, as it is quite soothing. Cleanse your face with a gentle handmade cleanser such as rose cream Cleanser or cleansing milk by a wet cotton wool. Use upward, circular movements of the fingertips to gently stimulate the skin and help lift surface debris and excess oil. Repeat twice to remove all the dust and grime. And then if you want, lightly massage cleansing milk in circular movement. Rinse with warm water and gently pat excess moisture from face with a soft towel. It is useful for people who wear heavy make-up. After cleansing, it is important, to tone the skin using ingredients that help balance the pH of the skin, which is typically disturbed during the cleansing process. Apply the toner with a soft cotton pad, but do not rub the skin. Rather, saturate the pad and pat the toner over the face and neck area. Do not pat skin dry. Avoid eye area when using toner. Your skin is now ready for moisturizing. Moisturize your skin using Aromatic Facial Oil, which contains a host of soothing ingredients to add moisture and nutrients to your skin. To seal in the moisture, be sure to apply the oil while the skin remains damp from applying the toner. Gently apply the oil to your face and neck using patting motions. For oily areas of the skin, one application of oil is sufficient. Apply twice to dry areas of the skin, waiting about 2-3 minutes between applications, and being sure to moisten the skin slightly with water or toner before the second application. For cleansing the face apply a paste of 1/2 tsp. Milk powder, 2 drops Lemon oil, 1 drop Cedar wood on the face and neck and massage for a minute or two. Then wipe using a tissue or cotton. For toning, apply on skin a paste made of fuller`s earth, 2 drops rosemary and 2 drops basil and leave it to dry. Then wipe it with wet towel. The third step is moisturizing. So, take any good quality non-perfumed moisturizing cream. To it add 2 drops Lavender. Apply gently on skin. To cleanse the face, make a paste of 1 tsp. milk powder, I pinch sugar, 2 drops basil and 2 drops lemon and apply on the face and neck and gently massage. Then wipe using tissue or cotton. For the toning, make a paste using almond powder, 1-drop lemon and 1-drop rose water and apply on the face and leave it to dry. Then wipe it with wet towel. For the moisturizer, take any good quality non -perfumed moisturizing cream. To it add 1 drop Rose and 1 drop Sandalwood. Apply gently on your face. For cleansing, make a paste of 1-tsp. milk, sandalwood powder and almond powder. Apply on face and neck and massage. Then wipe using tissue or cotton. To tone the face, make a paste using almond powder, 1/2 tsp. honey and 1-drop rose and apply on the face and leave it to dry. Then wipe it with wet towel. For the moisturizer, take any good quality non -perfumed moisturizing cream. To it add 1-drop rose and 1 drop lavender. Apply gently on skin. To cleanse, apply a paste using 1-tsp. milk powder, 2 drops of Rosemary and 1 drop of juniper berry on face and neck and massage. Then wipe using tissue or cotton. For toning the face in the dry areas, make a paste using Almond powder, 1-drop lemon, 1 drop rose and apply on the face and leave it to dry. Then wipe it with wet towel. And for the oily areas, make a paste using Fullers Earth, 2 drops Rosemary and 2 drops basil. Then apply on the face and leave it to dry. Then wipe it with wet towel. To moisturize the face, take any good quality moisturizing cream and add 2 drops Lavender. Apply gently. To clean the face, apply a paste using 1/2-tsp. milk powder, 2 drops of lavender and warm water on face and neck and massage. Then wipe using tissue or cotton. For the toning, apply on skin a paste made of fuller`s earth, 3 drops Chamomile and honey and leave it to dry. Then wipe it with wet towel. For the moisturizer, take any good quality non -perfumed moisturizing cream. To it add 5 drop Rose. Apply gently on skin.